Basic recycling is actually very easy. Once you know that your recycling is going to be picked up every week it becomes a matter of routine to sort out the papers, plastics and soda cans. The challenge is for those items that aren’t going to fit into the recycling bin. What happens when you want to take care of big appliance recycling? That is a task best turned over to Junk King Chicago West. Sooner or later, your refrigerator, dishwasher or wash machine is going to give out on you. Any one of those big appliances can actually be recycled. That doesn’t automatically mean it will be melted down and used to create new steel. Dropping an appliance off at a charity that repairs them could also be considered as recycling. Both of those options are on the table when you hire Junk King Chicago West. They make this type of drop-off every week and it is part of their complete junk removal package. You also need at least two movers to get that big appliance out of your house. That is also what Junk King will provide. These movers have been licensed and insured. That makes them the exact type of worker you should be inviting into your home. Although your main objective might be to get rid of that big appliance, there is no reason why you can’t put the Junk King crew to work around the rest of your house moving any other unwanted items. Take full advantage of this crew to clear out the clutter from your closets and the rubbish from your garage. They can also climb up and down the stairs to get at any old furniture either in the attic or down in the basement. But you don’t have to stop there. Junk King Chicago West can also clear way any yard debris. Your crew won’t be afraid to get their hands dirty when it comes to removing your rubbish. As for scheduling, Junk King works around your schedule. You can coordinate the big appliance pick up on the same day that you have the new appliance scheduled for delivery. 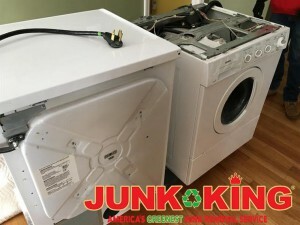 When it comes a junk clearing and big appliance recycling, Junk King Chicago West is the best partner for this task. This entry was posted in Carol Stream Appliance Removal, Carol Stream Junk Removal and tagged appliance removal, jjunk King, junk removal on October 31, 2017 by Junk King. Last updated October 31, 2017 .